I was listening to the the BeanCast marketing podcast this week and the panel were having a really interesting conversation about the way mobile is transforming the way we interact with things, particularly brands. A clever metaphor that was offered was that our phones are a ‘mouse for the real world’. In the same way we click using a mouse on a desktop to interact with our programmes, the internet etc., our mobile becomes the tool to interact with the physical world. But brands could go a lot further to utilise this especially bringing your physical browsing activity into your digital experience. Some brands are definitely doing it but I am interested to see further innovation which creates such a seamless experience that you want to use your mobile in a brand’s store for example. Being able to scan a product, check stock, get special offers, save for later, save to a wishlist… the list goes on. My issue around these branded experiences is that they are often so specific to that brand or a particular app that it’s a task in itself to remember all of the individual apps and what they can do. For me, I want my brand apps to link into the other tools that I already use online. If lots of different brands were all using the same wishlist functionality for example, that I could access outside of those brands’ apps, then I would be much more likely to use them. I just upgraded my phone to the Samsung Galaxy S4 from the S2 and I am certain I will only use my phone more. It’s the reason I prioritised a plan with unlimited data – I don’t want to pay for the data I use, I just want to use it whenever I need to. Again, it needs to be seamless for it to be truly useful and the Samsung’s beautiful big screen means I don’t need a kindle or a tablet or an MP3 player. Convenience is key and the more my mobile can help me navigate everyday life the better. What about you? How many ways have you used your phone today? 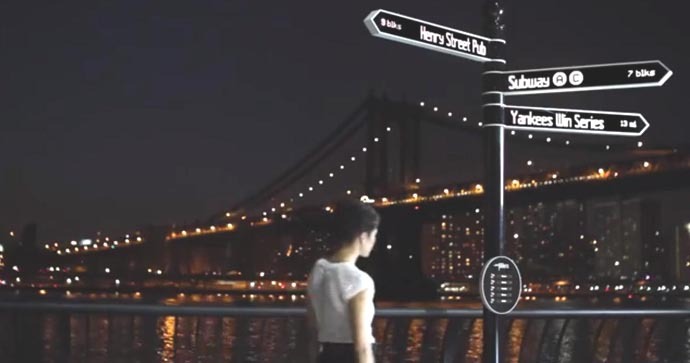 This also got me thinking back to Points, the digital signpost that got picked up in news a little while back. The idea being that it would use real time data and information to help tourists, and locals, navigate an area. e.g. it might show tips from Foursquare of local places or highlight a particular event taking place right now. It’s such a good idea. I thought digital bus timetable updates were a great idea and this just extends that thinking and puts the information we can get on our phone into the physical world – even more useful for tourists who don’t want to pay for using their mobile abroad. Read more about Points here.